Editor's note: This story was updated June 16, 2014, to clarify the treasurer's plans to remain on staff until June 30, 2015, to ease transition to a new treasurer. LAKELAND -- The man who led Florida Conference churches out of the worst economic wilderness since the Great Depression will turn his calculator over to a new financial watchdog in early 2015. 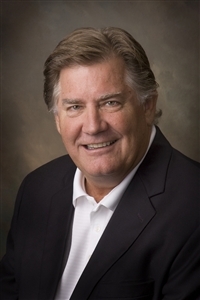 Milton E. “Mickey” Wilson, 68, Florida Conference treasurer for eight years, announced today (Thursday) to Annual Conference members that he expects to step down as treasurer Jan. 2, 2015. A collective groan sounded across the Exhibit Hall at The Lakeland Center, where the second day of the annual church business meeting was underway. Typical of his style of delivering financial reports over the past eight years, Wilson followed up with some wit. After he and his wife, Marsha, determined that this would be the year for him to retire, he said he asked her, "In your wildest dreams, did you ever think I would be retiring? "And she said, 'You've never been in my wildest dreams.'" Wilson said in an interview that the Conference Council on Finance and Administration will appoint a committee to conduct a national search for his replacement, with a goal of appointing someone this fall. He said he will help his successor through a transition period and expects to stay until June 30, 2015. But golf and grandchildren are calling him back to Nashville, Tenn., where he and Marsha lived for 30 years before Wilson joined the Florida Conference staff in 2006. The couple retains a home there. Three of those grandchildren were born since the couple began spending most of their time at a second home in Lakeland. Wilson said he doesn’t want to miss out on their early years. “I want to see T-ball games and see every activity, you betcha,” he said. He also is an avid golfer who travels and competes in tournaments. “If I’m going to break 70 by (age) 70, I’ve got to get more time on the golf course,” Wilson quipped to his staff earlier this week. Wilson anticipates seeking election next year as a Florida Conference lay delegate to the 2016 General Conference. A longtime United Methodist, he expects to be active in the Tennessee Conference after his retirement. Before joining the Florida Conference, Wilson served a little over a year as chief financial officer for the General Council on Finance and Administration, United Methodist Property and Casualty Trust and the United Methodist Foundation. He enjoyed a long, successful career in banking and leasing before that. Wilson said he has seen the staff in his department and throughout the Florida Conference grow in professionalism and competency, and he believes he will leave the church in good hands. "I have a real easy job," he told the crowd at Thursday's Annual Conference business session. "And it's because of these people."